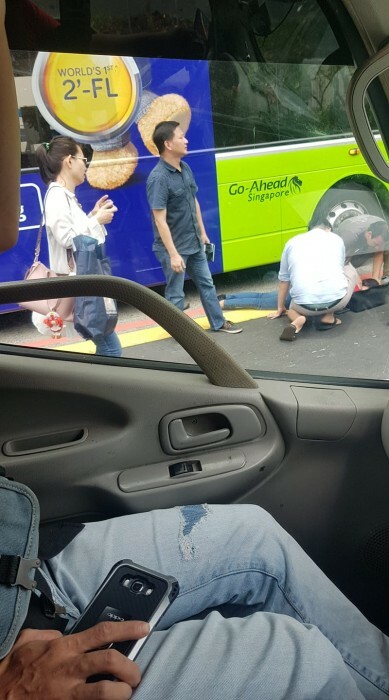 A 26-year-old woman was taken to hospital after she was hit by a Go-Ahead public bus along Hill Street on Wednesday afternoon (Sep 19). A Stomper alerted Stomp to a photo posted by netizen Ariel Olivera's showing the injured woman lying on the road. In the photo, onlookers are seen bending down to attend to her. When Stomp reached out to Ariel, he said that he was at the scene at about 1.15pm. "The person was lying on the road motionless near the bus," he said. "There was a van a distance away. The bus and van were the only stationary vehicles there." He added that the incident happened near the Civil Defence Heritage Gallery. The police told Stomp that they were alerted to an accident involving a bus and a pedestrian along Hill Street towards New Bridge Road at about 1.19pm. The pedestrian, a 26-year-old woman, was conscious when taken to Singapore General Hospital (SGH). The bus driver, a 60-year-old man, is assisting with investigations. In response to Stomp's media queries, a Singapore Civil Defence Force (SCDF) spokesman said they were alerted to a road traffic accident along Hill Street at about 1.20pm and the woman was taken to SGH. "Go-Ahead Singapore is aware of an accident involving our bus service 2 on Wednesday, 19 September 2018. "We are currently assisting the Police with their investigations."